This Air Cruise Collection is exceptional. Throughout the itinerary, the accommodation will be in exclusive luxury locations and the excursions will be astonishing. The cuisine will be the culinary creations of local chefs. Their guests will be introduced to diverse cultures and customs. The air cruise goes to seven countries. From London to Jordan, India, Vietnam, Laos, Cambodia, Maldives and UAE. At London Gatwick Airport, the private Boeing 737 will be ready for a morning departure to Aqaba in Jordan. Enjoy the service and relax in the comfortable seats on-board the flight. Stay for 2 nights at the recently opened Al Manara, a Luxury Collection Hotel, that guards the mouth of Jordan’s Saraya Lagoon. The hotel is located on the shores of the Red Sea and set against the rugged backdrop of the expansive granite mountain range. It hotel is exceptionally appointed and has private sandy beaches. This hotel is situated at an ideal location to explore Petra the next day. After breakfast, the guests go from Aqaba to Petra. They will enter the city of Petra on foot through a narrow passage through the rock, known as the Siq. A local guide will share the fascinating history of the ‘rose-red’ city. The ancient city of Petra was built by the Nabataeans between 800 BC and 100 AD. In this period, Petra was no more than a fort carved out in an area that was almost impossible to reach. In the first and second centuries, when the Romans took over the city, Petra reached the height of its fame. Petra takes up an area of around 100 square kilometres and there are more than 800 monuments. When transport by boat took over from the caravan routes, the city’s importance dwindled. The city of Petra was abandoned and lost to the world until it was rediscovered by Swiss explorer Johann Ludwig Burkhart. These days, Petra is the number one attraction in Jordan and known as the ‘rose-red city half as old as time’. The Treasury or Al Khazneh featured in the movie ‘Indiana Jones and the Last Crusade’. Back in Aqaba, enjoy the amenities on offer at the resort. After an early breakfast, fly to Agra in India. Be spoilt with the service, drinks, snacks and lunch available on board the flight. The flight arrives in Agra at the end of the afternoon. Agra is still associated with the Mughal period. 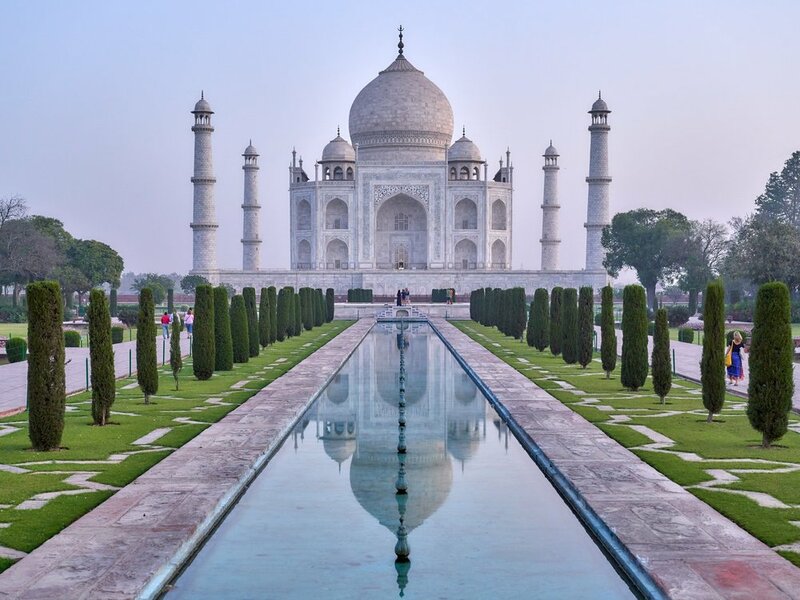 The Mughals were not only great rulers, but they were also famously capable builders, who created the architectural wonders in Agra and its surroundings, including the Taj Mahal, the most important of them all and an absolute masterpiece in Mughal architecture. Also visit the imposing, but elegant Agra Fort, the delicate artistic Tomb of I’timād-ud-Daulah, and Fatehpur Sikri, the former capital of the Mughal Empire. They are exquisite and each of extraordinarily high quality. The accommodation in Agra is at the luxurious Oberoi Amarvilas Resort. This resort enjoys a unique location in Agra, being within 600 metres of the amazing Taj Mahal. Every room offers a view of this architectural wonder. The rooms and suites contain elements of the Mughal period and are all decorated with tasteful interiors. Dinner is at the hotel. The Taj Mahal is truly astounding and a highlight of the air cruise. Its construction took 22 years and provided 20,000 people with work. The white marble was mined and transported to the construction site by a fleet of one thousand elephants. It was commissioned by the Mughal emperor Shah Jahan, as an expression of his affections for his wife Mumtaz Mahal. Marvel at the beauty of this architectural jewel. During lunch, enjoy traditional Indian music and dance along with an impressive view of the Taj Mahal. After lunch, enjoy a tour of the city of Agra or choose to hang back and enjoy the luxury and comfort of the resort. In the evening, there is a themed dinner ‘Jodha Mahal’ to enjoy. Fly to Hanoi in Vietnam, enjoying lunch during the flight. Hanoi is Vietnam’s main political centre. In October 2010, the city celebrated its 1000-year anniversary. On this occasion, Hanoi was named one of the world’s ‘Top Destinations in 2010’. With its broad boulevards and imposing colonial mansions, Hanoi oozes French colonial history at every turn. Despite having 4 million inhabitants, the ambience in Hanoi is peaceful. The city centre is located around Hoan Kiem Lake in the Old Quarter, which is a good choice for sightseeing. In Hanoi, you will have dinner and stay at the Sofitel Legend Metropole Hotel. North of Hoan Kiem Lake is the city’s oldest district, Hanoi’s bustling commercial centre. South of the lake is the French quarter, which is known for its magnificent colonial buildings. The tour includes a visit to the Temple of Literature, Vietnam’s first university. The Temple of Literature is made up of five different inner courtyards. An oasis of calm and a pleasant retreat from the streets of Hanoi, the Temple of Literature was established 900 years ago to educate the sons of Mandarins. After lunch, there is plenty of time to explore the city, go shopping or enjoy the facilities of your hotel. After breakfast, depart for Halong Bay, where, later in the afternoon, the guests will board a luxury 3-day cruise within one of the most beautiful natural bays in the world: Halong Bay, with thousands of small islands and colourful floating villages situated in emerald green seas. Halong Bay is one of the most stunning bays in the world and is listed as a UNESCO World Heritage site. The cruise ship, the Au Co, is 55 metres long and more than 10 metres wide. It has more than thirty luxury cabins, each with a private balcony or terrace. The cabins have been nicely decorated with an eye for detail. The restaurants and open-air bars have been designed according to the principles of Feng Shui and heighten the feeling of being at one with the beautiful surroundings. Dining on-board the Au Co is a culinary experience not to be missed. Every meal is a sensation for the palate. Enjoy the view over these poetic landscapes, while the best chefs will be preparing the most wonderful food. The menu uses local ingredients, locally sourced seafood and vegetables grown on Cat Ba Island. There is a visit to the Au Co Green Farm on the second day of your cruise. During the cruise with the Au Co, the guests will experience the charm of Vietnam and flavours of the Orient. There are plenty of activities on offer: Tai Chi lessons, cooking workshops, lectures on the culture and history of Vietnam and visits to the local communities that live in the world-famous region. The programme and the route of the cruise are all dependent on nautical and weather conditions. After breakfast, return to Hanoi for the flight to Luang Prabang. Lunch will be served during the flight. Laos, with its vast, green and mountainous landscape, has become an increasingly popular destination for travellers. Despite the growing interest of tourists, Laos still offers visitors a slice of untouched Asia, with terraced rice fields, breathtaking temples and incredibly friendly and welcoming people. The ancient town of Luang Prabang is a designated UNESCO World Heritage Site. Circled by mountains, Luang Prabang is quite possibly the most beautiful place in Southeast Asia. Luang Prabang is without a doubt the most charming town in Laos. With its French colonial buildings, picturesque alleys, impressive panoramic views, stunning temples, young monks in saffron robes, luxurious boutiques and cosy eateries, there is plenty to explore. Rise early for the alms giving ceremony, a wonderful opportunity to experience an ancient Lao tradition. Watch the procession of colourful, barefooted monks walk by as they collect their daily alms. Then explore the town and its surroundings. Take a boat trip down the Mekong River to the sacred Pak Ou caves, filled with Buddhist statues. Marvel at the spectacular Kuang Si waterfalls. See the scenic country villages, French colonial architecture and local weaveries, and have the opportunity to meet local people. Fly to Siem Reap in Cambodia. Siem Reap is influenced by French Colonial and Chinese architecture. The place is known as the gateway to the world-famous temple of Angkor Wat. There is also the Wat Bo temple in Siem Reap itself. The latter has beautiful, well-preserved frescoes on the life of Buddha. Spend the next two nights at the Belmond La Résidence d’Angkor. Retreat to the salt-water pool, or indulge yourself at the Kong Kea Spa. First, the guests will go to the ancient city of Angkor Thom by tuk-tuk. Angkor Thom was the last capital of the Great Khmer Empire under the reign of Jayavarman VII. This city is surrounded by an eight-metre high wall that forms a perfect square. The city is entered through the ancient South Gate, an impressive stone gate with elephants and four large carved out faces in the rock. Visit the Bayon Temple with its 54 towers, each representing a province of the Khmer empire. Ta Prohm is one of the most famous temples in Cambodia, partly due to the movie ‘Tomb Raider’. This jungle-covered complex is impressive to see in pictures, but in reality is even more stunning. It appears as though the trees are trying to smother the construction with their roots that twist and turn around the temple. After lunch, return to the hotel to relax during the midday heat. In the afternoon, explore the famous Angkor Wat temple, built during the reign of King Suryavarman II in the early 12th century. Inside the temple, the walls are covered in stone carvings and bas-reliefs from Hindu mythology. Dinner will be served at a special location. At Siem Reap Airport, board the private jet to Malé in the Maldives. After arrival at Malé Airport, the guests will be taken to their resort by seaplane. The seaplane flight is an experience in itself. During the flight, enjoy extraordinary views that reveal the vastness of the archipelago. The Maldives is a group of islands that contains 1,190 coral islands, comprising 26 atolls in the Indian Ocean southwest of India. The islands are spread across an area of around 90,000 square kilometres, but the landmass totals no more than 298 square kilometres. The largest island is 5 square kilometres and there are only nine islands that are more than 2 square kilometres. Two hundred islands are inhabited, 88 are resorts. It is a real-life paradise with the white-sand beaches and tropical blue water. The islands boast a rich underwater world of colourful coral reefs and a wide variety of fish, including trumpet fish, clown fish, stingrays, barracudas, mantas and sharks. The local inhabitants are hospitable and live mainly off the tourism industry, fishing and ship-building. Dinner and accommodation at The Hurawalhi Island Resort. The Hurawalhi Island Resort in the Maldives is unrivalled, extraordinary and unique. Its environmentally-friendly innovations, breath-taking underwater restaurant, tropical Champagne Pavilion, stylish villas, and with no other resorts in sight make this a unique location. This is an adults only resort. Hurawalhi offers its own take on paradise. This is the Maldives redefined – a unique five-star resort experience, hidden among the spectacular coral reefs of the Lhaviyani Atoll. The resort offers a selection of exquisitely designed, exclusive and spacious villas. Perfectly situated, it allows guests to enjoy panoramic views of the sun rising and setting. There is a selection of restaurants, including on the beach, over the water and even underwater, a manifestation of the philosophy held in Hurawalhi that nothing is impossible. Hurawalhi is unique in terms of its innovation in the area of sustainable tourism. Using solar panels, an independent water bottling plant, energy efficient solutions, warm water recycling and an in-house marine biologist, its ecological credentials are up there as the best in the Maldives. The island is also a breeding ground for green turtles, mantra rays and nurse sharks. The marine conservation and education company, Wise Oceans, is responsible for the preservation of this fragile eco-system. Snorkelling and diving here is an unforgettable experience. Wise Oceans works closely with the PADI diving centre at the resort. Stay for three nights at the Hurawalhi Island Resort in a luxurious Ocean Villa. The stay is based on All Inclusive Plus. Upgrades are available. Dining takes place at the Canelli Restaurant. 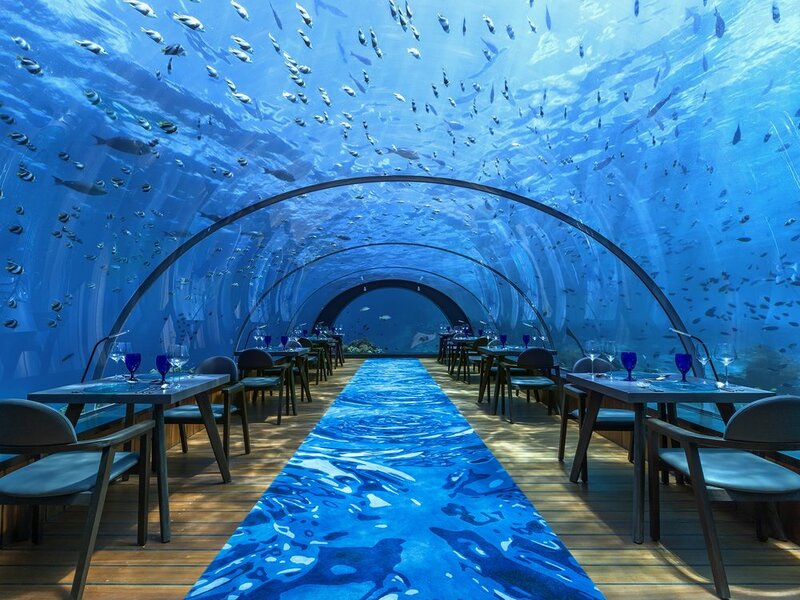 Additional charges apply to a la carte menus and lunches and dinners in the undersea restaurant. Return to Malé Airport by seaplane, before boarding the private jet to Abu Dhabi in the United Arab Emirates. Lunch is served on-board the airplane. The capital of the United Arab Emirates has modern interpretations of Arab architecture, villas and palaces in the Corniche Riviera style. A new addition is the majestic Sheikh Zayed Mosque, the third largest mosque in the world, named after Sheikh Zayed bin Sultan Al Nahyan, the first president of the United Arab Emirates. The stay includes a city tour through Abu Dhabi, to enjoy the main sights in this special city. Dinner is at a special location, to enjoy local, culinary delights. 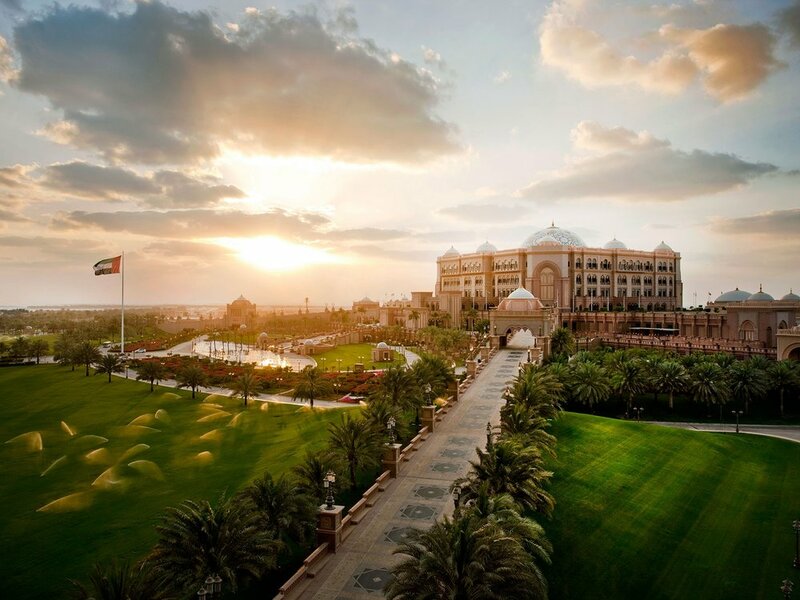 Stay overnight at the magnificent Emirates Palace in Abu Dhabi. It is the hotel sensation of the United Arab Emirates, sited amidst a 100 hectare plot of land with beautifully sculpted gardens. Emirates Palace is built like an Arabian palace along a 1.3 km long sand beach. The lobby is spectacular with its many lounges and an imposing 60 metre high dome, finished with a mosaic of glass tiles and gold. This exclusive hotel is decorated with marble and chandeliers from Italy. Before the flight back to London, there is time to enjoy the luxuries available at the resort. Abu Dhabi has a number of splendid shopping malls including the Al Wahda Mall, the Marina Mall and the Yas Mall. It will also be possible to visit Ferrari World or the Louvre Museum. In the afternoon, fly back to London. The flight arrives at London Gatwick Airport during the evening.